Just prior to Thanksgiving in 2008, I was in Southern California visiting my parents. Instead of dealing with the heavy rush at the airport the day prior to Thanksgiving, I decided to fly out a few days earlier and explore the Salton Sea area of California. If you have not been in this area of Southern California, it is an interesting blend of environments in not too large of an area. The day I was ready to head back to San Diego, there was some rain which moved through the area early in the morning and made exploring on some of the dirt roads interesting. When pulling off the side of the road to park and grab some photographs, I found the mud which was starting to take over the rental car at times. In the past when leaving the Salton Sea area I have just headed back to the interstate near El Centro, however looking at the map I decided to take a different road just to find out what exactly is Plaster City. As I headed away from the Salton Sea, I was running into some rain showers which were quite isolated but enough to let the pavement get wet. As I turned west towards Plaster City I noticed the blue skies in the distance but also the wet pavement brought a great contrast between the two elements. 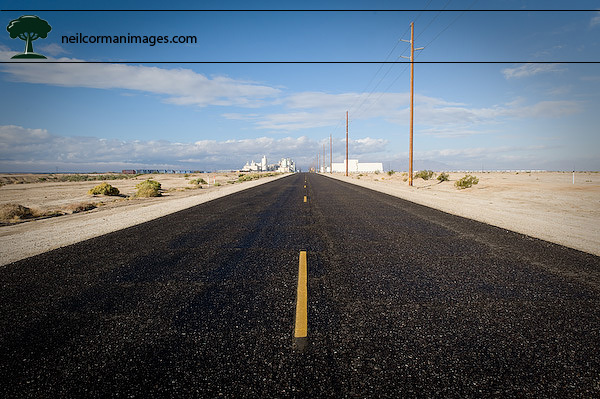 Once I got closer to the buildings which make up Plaster City I pulled off the road and while there were no traffic was able to photograph the Road to Plaster City. It wasn’t long until the sun was out and the roads dried up quite quickly in the desert conditions. In case you were wondering “What is Plaster City?” Plaster City, is an unincorporated area and home to a large United States Gypsum plant which makes the SHEETROCK brand of gypsum panels. The plant is connected to a gypsum quarry by a 20 mile narrow gauge railroad which is the last industrial narrow gauge railroad in the United States.